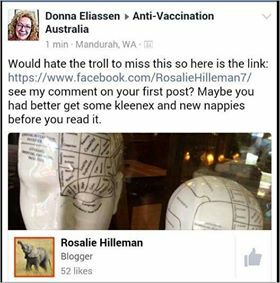 Another day, another dangerous, wildly misinformed bunch of nonsense in the notorious Facebook group, Anti-Vaccination Australia. The confidence and ease with which these people risk the lives of their own, and other peoples’ children is truly appalling. Whooping cough is a deadly disease that has brought about the deaths of several Australian babies in the past few years. In the wake of Riley Hughes passing (which could have been prevented had his mum been given a whooping cough vaccination in her third trimester of pregnancy), state and territory governments across Australia funded third trimester whooping cough boosters for pregnant women. While it is too late for those babies lost to pertussis, this measure has, without a doubt, saved lives in this country. Cormit Avital was fortunate enough to be offered the whooping cough booster for her baby’s protection while she was pregnant. 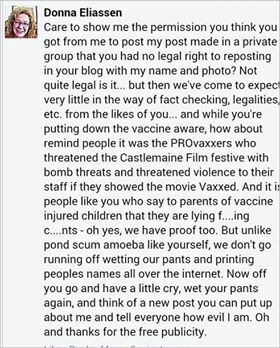 Unfortunately for her baby daughter Ava, Cormit refused the vaccine. Ava contracted whooping cough and spent a month in intensive care fighting for her life. Riley, Ava and all the other babies who have suffered and died from this terrible disease are testament to the importance of the maternal pertussis booster. 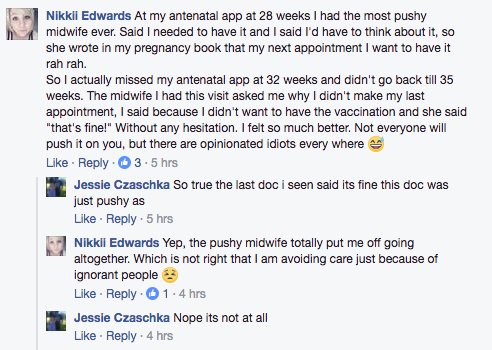 “At my antenatal app at 28 weeks I had the most pushy midwife ever. Said I needed to have it and I said I’d have to think about it, so she wrote in my pregnancy book that my next appointment I want to have it rah rah. and Tristan: “dont just say NO. say ‘”I listen to doctors at the CDC like Dr William Thompson” who proved that vaccines are linked to autism. in other words, saying NO just makes the doctor think you are a “crazy person from the internet”. telling him facts makes him realize you are awake and intelligent and ..may even force him to check out Dr William Thompson and the movie VAXXED”. 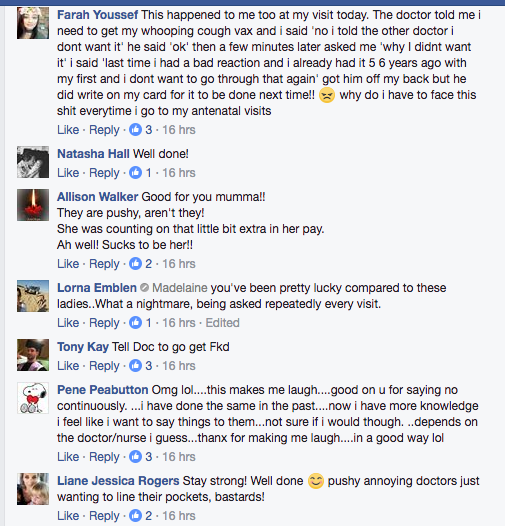 There is more in the conversation, including advice for Jessie on birthing twins naturally and how to circumvent the hospital policy of performing a C-section for the safe delivery of twins, because, you know, these people know so much more than trained medical professional like obstetricians. Will these people enthusiastically giving advice and encouraging these three mothers in their decisions to put their babies lives at risk shoulder any responsibility if there is a tragic outcome here? I think we all know the answer to that. They showed this recently by turning on one of their own when a deliberately unvaccinated child from the Northern N.S.W Coast was airlifted to a Brisbane ICU with tetanus. They dismissed the story as “manufactured,” accused the parents of being “actors,” of not tending to the child’s wound properly, along with accusing the hospital of causing the tetanus in the hospital setting. That is exactly what they did to Cormit Avital as well. They are all “love and light” until their beliefs are challenged, or until they are confronted with the consequences of those beliefs. Four babies are soon to be born without the benefit of protection from whooping cough. I do hope that luck is on their side. 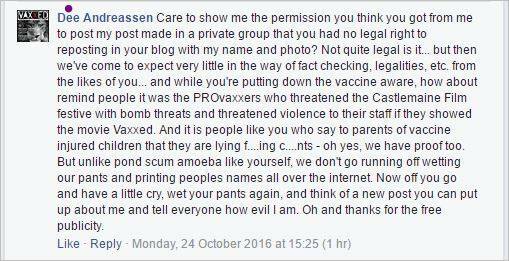 Abuse, Threats of Violence, Claims of Innocence, and Hypocrisy from the Anti-vaccine Camp. I’ve been quiet of late because, well, I have a life, but the anti-vaxxers are outdoing themselves again and instead of taking to Twitter with multiple tweets I thought I’d collate my thoughts here. That won’t take long, I’m apparently one of the ‘sheeple’ and we are said to let the media do our thinking for us but I’ll give it a crack. This week the Victorian Health Minister Jill Hennessey hit back at the abuse she has received from anti-vaxxers, in newspaper stories and a video of her reading out messages they had sent her. 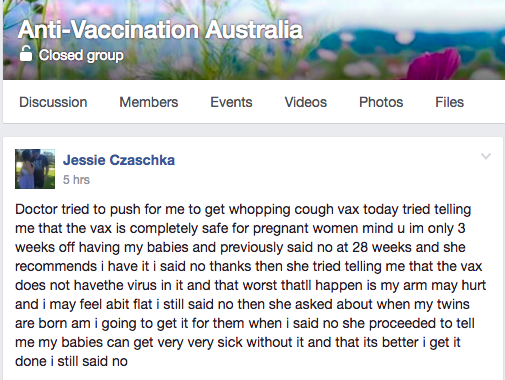 Good on her, I admire her stance and strength on all things vaccination. Predictably, as they do when they have to look in the mirror at their own actions, the anti-vaxxers went into meltdown declaring themselves innocent, screeching “it wasn’t us” and “pro-vaxxers did this to discredit us” and demanding proof from the minister. One genius even observed that one message was 212 characters long and Twitter doesn’t facilitate messages of that length. Oh dear, someone please tell him that Twitter is only one means of electronic communication. 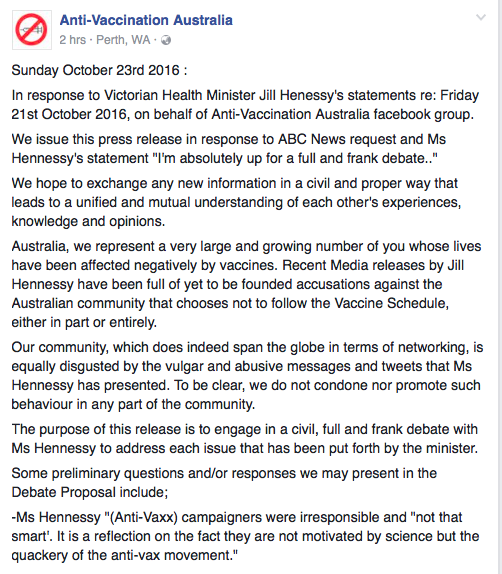 Then today, Anti-Vaccination Australia released a “press release” on their Facebook page again declaring their innocence. Of note is the location of which the release was posted; Perth, Western Australia. 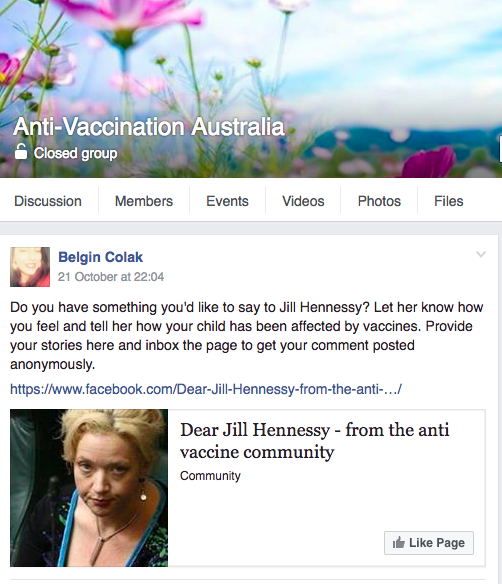 “Recent Media releases by Jill Hennessy have been full of yet to be founded accusations against the Australian community that chooses not to follow the Vaccine Schedule, either in part or entirely. 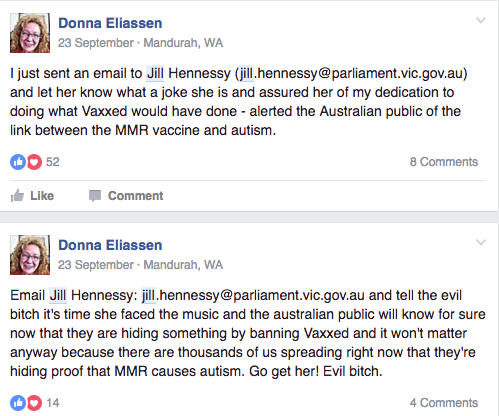 I took a look in the cesspit that is the Anti-Vaccination Australia group, and it took me 30 seconds to find these two posts encouraging people to send emails to Minister Hennessey. The second one is one that was read out in the video Minister Hennessey made. There is more, but to be honest I CBF. A legal demand via Facebook post. I’m sure she was acting on legal advice when she took to my facebook page as well. Here she makes unsupported claims, adds a couple of insults and thanks me for the “free publicity.” You’re welcome, I presume that means you are retracting the legal demand to remove the screen captures within 24 hours? Cheers. I’m a busy person and I don’t know if I could have gotten to it so quickly anyway. Thank you for the publicity. 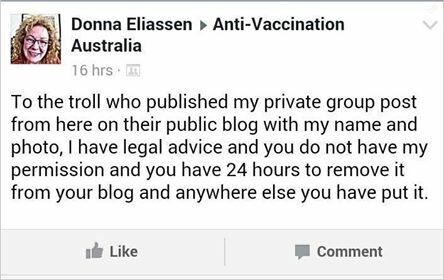 Wanting to make sure I see her change of heart, she posts another legal notice in Anti-Vaccination Australia for me. Curiously, someone by a different name then came along and posted an identical message on my Facebook page. I have no idea how that happened unless someone was playing in the sock drawer and got their socks mixed up! I don’t know if someone who can’t get her socks on right should be throwing out childish insults like “wet your pants” but anti-vaxxers aren’t known for logic or intelligence I suppose. Here We Go Again. Credulous Media Enabling Another Cancer Disaster. Carissa Gleeson is a 22 year old woman from Western Australia who was diagnosed with a synovial sarcoma in 2015. She has spent much of her time working on cattle stations and has a love of the land. Now she is channeling that passion into beating her cancer. What an awful shame that she appears to be seriously misguided. Just like Jess Ainscough, Carissa was offered conventional treatment but has refused in favour of putting her faith in a cancer quack/ entrepreneur. Jess chose Gerson “Therapy”, while Carissa is following the lead of Ty Bollinger and his documentary that includes the usual suspects including Mike Adams, Stanislaw Burzynski and Joseph Mercola, just to name a few. Carissa’s cancer is a slow progressing one with similarities to the cancer that Jess had, so it will appear for some time that her “treatments” are working, until it becomes clear that they aren’t. Cutting out all processed sugar and other processed foods from her diet. Only eating organic foods, including fresh vegetables grown in her own garden. Drinking lots of alkaline water. Cleansing / juice and water fasting. High dose intravenous Vitamin C.
The first two things on that list would benefit the health of just about anyone. They won’t cure cancer though, not even when combined with the rest of the quackery on the list. Also like in the case of Jess Ainscough, this pursuit of unproven quackery is putting a financial burden on the family. At the time of writing, Carissa’s gofundme fundraising page has received $13,320 of a $60,000 goal. Goodness knows how much she has spent so far, and how much she will need in the future to continue this nonsense. $60,000 is nothing to be sneezed at though, and it seems that is just a proportion of the costs of her “treatments”. Quacks and alternative ~to~ medicine proponents tell us that cancer is big business. It sure is for some, certainly not for those they aim those comments at, but rather closer to home. Finally, and again, just like Jess Ainscough, if Carissa insists on following this path, she will succumb to the cancer and the quacks who encouraged her down the path of useless treatment while profiting off her will be nowhere to be seen. If we do hear from them it will be to place the blame of her death clearly at her own feet for not doing their treatments right, or not having the right, or positive enough attitude. Along with them not working, the other predictable outcome with alternative cancer “treatments”, is that when they don’t work,the patient is blamed. It is as unethical as it is offensive. It remains to be seen whether the Australian media will fail this girl and the public by telling her story in the same way that it told the story of Jess Ainscough. Her story was told as one of a girl who miraculously cured her cancer, while she was slowly dying from an indolent cancer that was taking its expected course. The Sunshine Coast Daily is off to a bad start. I hope that they, and other media see the error of their ways on stories like these and report on them responsibly. Izzy’s (missing) Garden. Updated June 2016. Paleo Pete’s “tribe” and the “over to you” stories they won’t tell you. From the outset, I want to say that eating healthy food is a good thing. So is exercising and looking after yourself, and parts of the Pete Evans’ paleo program are doing exactly that. I applaud anyone who makes an effort to take care of themselves. 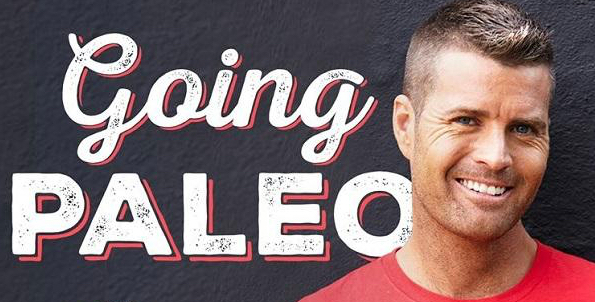 What I have a problem with, is Pete Evans elevating himself to the position of health guru. I have a problem with the all or nothing, obsessive, cult mentality of Pete’s paleo that could easily see people winding up with orthorexia nervosa and I have a problem with the carefully curated message from Pete’s paleo team as well, but more on that later. Go Paleo, before you all die! We have all seen the wonderful “over to you” anecdotes that Pete uses to promote his 10 week program on his Facebook page. There have been stories of people losing weight and feeling healthier, miraculous recoveries from health conditions ranging from irritable bowel syndrome to bipolar disorder, people ditching medications for serious illnesses, and even running marathons, but something has been missing. Unless every. single. person. who embarks on the program has a wonderful turnaround in health, there are anecdotes that we aren’t seeing. That’s ok though, because like the helpful soul that I am, I have been observing the paleo “tribe” and collecting them! The range of complaints I have witnessed in the closed paleo tribe group is listed below, and although this list is not exhaustive, I think I have gathered a good collection of the woes of the paleo tribe. I would have shared these with you on Pete’s page, but sadly I asked a question he didn’t like on there one day and got myself banned. Many of the ailments listed below were reported by several “tribesters”. Thinning hair with bald patches. 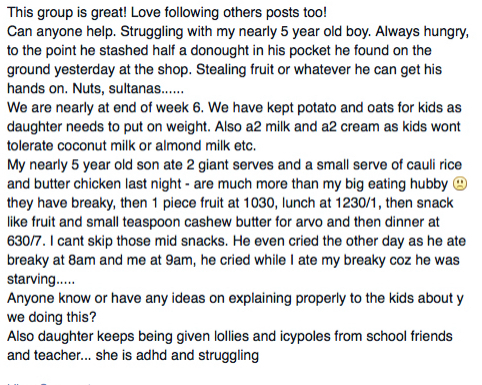 Child so hungry he steals food and cries because he is so hungry. Not only are people complaining of the above ailments and giving each other all kinds of health advice on how to deal with them, there has been some outright scary health advice given in the group by “tribesters”. Like this one who advised the wife of a man with high blood pressure (175!) that it probably isn’t that high, and that a homeopath can help. I hate to think of the harm that years of untreated of high blood pressure has done to her own husband. High blood pressure? No problem! Then along comes Alyx Lee, health expert (apparently) and chiropractor with health advice so far outside the scope of chiropractic, and a claim about chiropractic being proven to reduce blood pressure that is not supported by evidence. Why am I not surprised by a chiropractor giving rubbish advice on the Internet that has nothing to do with their own scope of practice? Perhaps a complaint should be filed with AHPRA. Chiropractor advises on blood pressure. Anyway, I am pleased to say that some sensible people urged the woman to get her husband to a doctor ASAP, but examples like this show the dangers of unregistered and unregulated health gurus who shun evidence based medicine and lead their followers to believe that their way is the only way and the best for their health. Looking a little closer at the paleo way of doing things raises alarms. The quick deletion of dissenting opinions on social media, the outright dismissal of criticism, while criticising actual trainned professionals is eerily familiar. Well, he did go to the same online ‘college of nutrition’ as Jessica Ainscough so they were bound to have come out with similar ideas and business models! 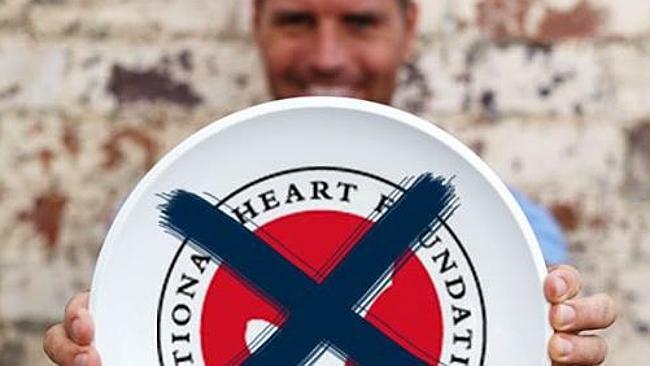 Paleo Pete goes out of his way to criticise food companies, the Dietician’s Association of Australia, The Heart Foundation and anyone else who either doesn’t agree with him, or criticises the restrictive paleo diet. 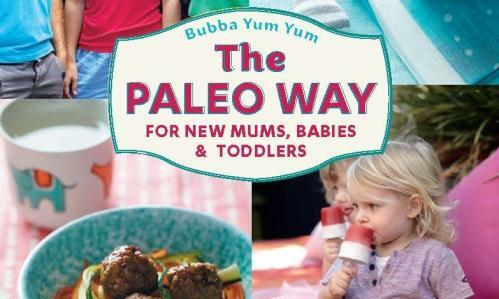 It is often claimed that they are scared of losing money now that the “paleo tribe” is growing and shunning packaged foods for fresh alternatives. Its all about the money for them you see, not health. While poor persecuted Pete is just trying to improve the health of the world as a charitable act. Oh wait… how many top selling paleo cookbooks does he have out now? Including the one that is so dangerous to babies that he had to self publish it electronically so people could buy it? Nah, I’m sure he doesn’t make a bucket of money selling books, surely not, because he just wants everyone to be healthy! Bubba Yum Yum. Electronically published last week. And the ‘tribe’. All those people who paid $99.00 to purchase access to The Paleo Way 10 Week Activation Program. Lets see, at the time of writing, there is 16,519 “tribesters” in the Facebook group attached to the program. At $99.00 each, that’s a tidy sum of $1,635,381 heading the way of Pete and his team. If only half of those people sign up to the follow up program at $49 each, that’s another $404,715.50, totaling $2,040,096.50. So, based on my guesstimates, its fair to say that Paleo Pete & co are making an absolute killing from The Paleo Way 10 Week Activation Program and the follow up program alone. In excess of $2 million dollars, so its in their best interests to dismiss anyone who criticises paleo to keep the punters on board. But lets not worry about any of this, because look! LOOK OVER THERE! Its another “over to you” success story! 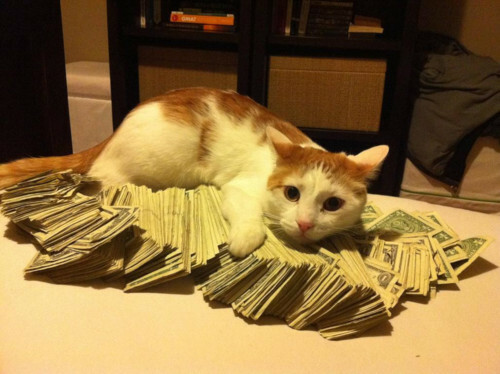 What money? My motivations are pure. Edited to add: Due to feedback received today I have removed the names from most of the screen captures, although anyone who expects privacy in a group of 16,000+ strangers with no screening process for entry is a bit naive in my opinion. Disclaimer: I do not work in the food industry, not is my income or livelihood dependant on anything to do with food, diets or health products. I do not get paid to write, nor do I make money from this blog, it is my hobby. If every person on the planet went paleo tomorrow it would not impact me one bit, so tribesters – when you try to explain away this blog post as “vested interests” or “someone threatened by paleo”, think again, and try to come up with some more original claims for a person who criticises your way of life, because the usual ones don’t apply. (Not that they apply to most other people they are applied to either). It would only have taken a scratch on the surface to reveal that all was not as it seemed, but no one bothered. The media reported her story, as told to them by Jess, without question. Until she died, then there was quite a few articles examining the futility of the treatments she chose to undertake. Too little too late though, that same media had already made into a minor celebrity as “the girl who cured her cancer”. Over the past few weeks another ‘amazing cancer survivor’ Bell Gibson is taking a fall from grace with revelations that her cancer story appears to have been a lie. At the time of writing Ms Gibson is yet to provide evidence that she ever had brain cancer, and has suggested that the other four types of cancer that she claimed to have developed were ‘misdiagnosed’. Penguin Books has pulled her “The Whole Pantry” recipe book off the shelves in Australia, and the app with the same name has been quietly removed from the app store. “Now what’s remarkable about Belle’s remarkable story is that no one who swallowed it apparently bothered to check it was true. Not the publishers at Penguin. Nor the chaps at Apple. Nor a parade of media admirers at The Sunday Telegraph, News.com.au, Cosmopolitan, Australian Women’s Health, Marie Claire, Elle, and Channel Seven’s Sunrise among others. 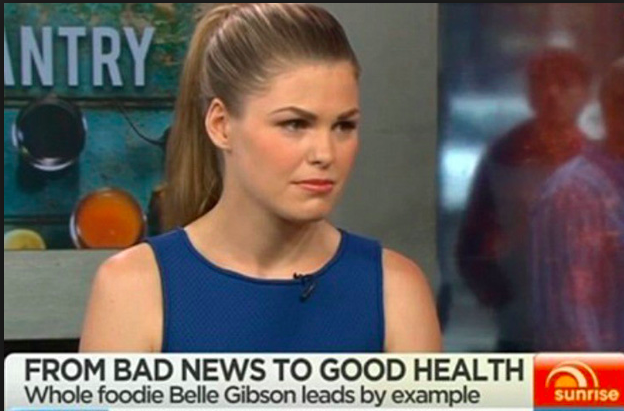 Bell shares her story on Sunrise. I couldn’t have put it any better myself. I hope that media take stock and learn from this embarrasing situation. The consumers of Australian media deserve better. They deserve due dilligence in health reporting. It has been one hell of a week around here. When the news broke last Friday that Jess Ainscough had passed away from the cancer she attempted to cure with Gerson ‘Therapy’, I took a few moments to pause and reflect on what the response should be on this blog. I decided to acknowledge her passing with this brief post, but to give her loved ones respect and space by not making comment on their loss at this time. We all know what it is like to lose someone we love, and I did not want to exacerbate their pain in any way. But then, fans and followers of Jess started googling her name and found this blog in their thousands. I guess considering the amount of traffic that has been here this week, the amount of unpleasant and nonsensical comments left is actually quite low. In any case, there has been too many of these comments to keep up with and moderate so I have numbered and collated them in one document for anyone who cares to spend their time reading the whole 25 pages of them, and I’ll share a few highlights here. One comment in particular sums up exactly how nefarious Gerson ‘Therapy’ is. Put simply, by ‘France ‘ (comment #98): if it doesn’t work, its your own fault. The comments generally fitted into the following categories, and I have included some excerpts for your reading pleasure. You can use the numbers to locate the full comments in the document here. 1. Outright insults and abuse, some even included passive aggressive ‘concerns’ or ‘well wishes’ for my troubled self. Drmschafer: (8) “What a horrible human being… Your ignorance and hate are what’s wrong in this world. 2. People who miss the point (being the spread, and profiting from health misinformation and the concealment of her actual condition), and think the issue is Jess’ freedom to make her own personal medical decisions. 3. People who thought Jess had never made any claims about being in the process of curing, or having cured herself. I moderated most of those through and responded with a link to this post detailing all the instances I could be bothered finding of her making such claims. 4. Fans of alternatives to medicine or those with anecdotes about cancer ‘cures’. 5. People wanting to tell me how unsuccessful or bad conventional treatment is, how evil doctors and pharmaceutical companies are. Because I couldn’t possibly have an opinion without someone telling me what it is and paying me to express it. Right? “Just curious ???? Where’s the comment I posted half an hour ago ????? Didn’t you like it ?????? “…the explanation for these people’s apparent complete lack of compassion toward another human being that has made the most sense to me is the research brought forward by leading psychologists and the National Institute of mental health. Having studied psychopathy in depth, they claim to have come to the conclusion 1 in 100 people have psychopathic, sociopathic tendencies. This can be as simple as an inability to feel empathy for others. So these folks are the kind of folks who watched Jess waste what time she had left on this earth following restrictive diets and pointless rituals. They cheered her on in their smug, superior, ‘knowledge’ that they all knew better than science and medicine, thinking she was infallible due to this superior ‘knowledge’. What they actually did was enabled and encouraged a young woman to squander the only chance she had. Jess may have made different choices if she didn’t have legions of google ‘researchers’ wellness warriors cheering on her every foolish utterance. She may have made the same choices. We don’t know. What we do know is that the wellness industry isn’t quite as full of positive, vibrant, healthy souls full of love and light as they would have us think. The mail received here in the past week is evidence of that. Even more predictable is they way The Gerson Institute washed their hands of her with this tweet. They took $5,500 per week, for three weeks to host Jess at their institute and convince her that she could cure her cancer with their ridiculous regime. They used her in publicity and she raved about them endlessly, no doubt raising their profile in Australia. Just like all health charlatans though, once it became apparent their quackery doesn’t work they pulled out the tried and tested method of blaming the victim. These people have blood on their hands, but most certainly no conscience weighing them down. 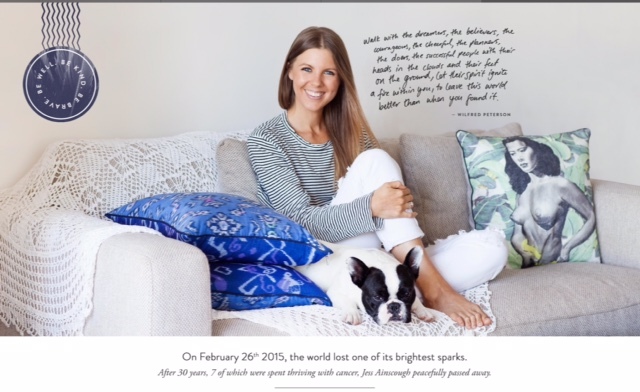 Edited to add: The Gerson Institute have issued a defence of their therapy tribute to Jess. Apparentley their ‘therapy’ isn’t a cure now, and it “can’t save everyone”. But they think it is important that people are free to chose pointless, expensive ‘treatments’ that won’t help them. Yup. No conscience at all. (Thanks to Alice for the tip). I know many people will have a lot to say about her passing, but please, lets just pause and spare a thought for her family, friends and those who loved her. There will be a time for discussion about Gerson “therapy” and other details, I don’t think it is now. My thoughts are with those who loved Jess and are hurting right now. To all the fans of Jess who have stopped by to share their thoughtful input, love and light, vitriol and insults, you have now been published in this post.